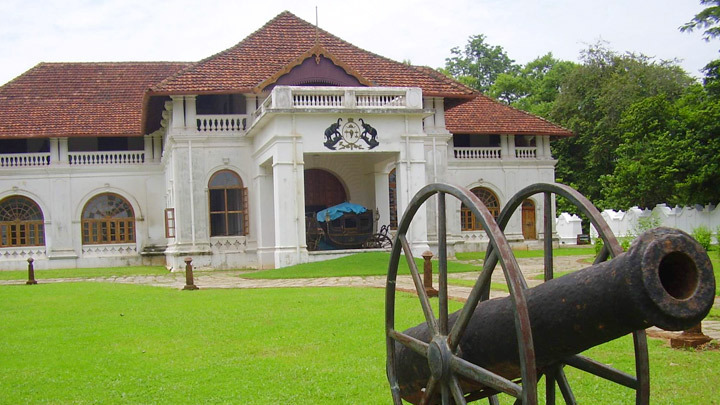 The Palace of Shakthan Thampuran located in the district of Thrissur is a landmark in the annals of the Perumpadappu Swaroopam, the former ruling dynasty of Kochi. The palace located in the heart of Thrissur town is a major attraction, especially for those with a special interest on rulers and dynasties. At the Shakthan Thampuran Palace, one can come across and understand several interesting and remarkable aspects of the erstwhile rulers of Kochi. Historians consider the reign of King Rama Varma Shakthan Thampuran (AD 1790-1805) popularly known as Shakthan as the golden era of Kochi. At a very young age itself, Shakthan Thampuran demonstrated extraordinary intelligence and bravery. During his reign, he maintained cordial relations with European powers including the English and also with rulers of neighbouring regions like Mysore and Travancore. Shakthan Thampuran was a farsighted ruler, whose outstanding administrative skills and diplomacy resulted in admirable achievements in key sectors. Situated close to the famous Vadakkumnathan Temple in Thrissur, the Shakthan Thampuran Palace formerly known as Vadakkechira Kovilakam was renovated by Shakthan Thampuran in its present form. According to the territorial expansion of erstwhile Kochi dynasty, the Shakthan Palace was its Northern most located one. The palace, built in the Dutch and Kerala style of architecture belongs to the few structures of this kind in Kerala. The main structure of the palace has a two-storeyed building and a traditional Kerala style Naalukettu. High roofs, extra thick walls, spacious rooms and floors paved with finely smoothened Italian marbles are some of the structural specialities of this palace. The interiors of the palace, because of its unique construction offer comfortable and pleasant staying conditions irrespective of the prevailing weather conditions. A visitor to the palace can find references to the rulers of Mysore, who have stayed at the Shakthan Palace at various points in time. It is also believed that Tippu Sultan entered the palace with his troops, and the flag mast that he erected can be seen close to the palace compound wall, in front of the palace. The final resting place of Shakthan Thampuran is also located inside the palace, besides that of a Zamorin and that of a ruler of Kochi. The palace also has a very ancient Sarpakaavu or Serpent Grove, which is a place for worshipping the serpents according to Hindu belief, and was once widely practiced in Kerala. Located on the Southern side of the Shakthan Palace is the Heritage Garden prepared recently to exhibit and preserve some of the indigenous plants and trees of Kerala. There is also an archaeological garden situated in the Northeastern part of the palace, where one could find collections from the Stone Age found from the outskirts of Thrissur. The Shakthan Palace, which was recently renovated by the State Archaeology Department with financial assistance from Kerala Tourism, also houses an elaborate museum. The museum houses some interesting galleries like the Bronze gallery, where one can find bronze statues belonging to the period between the 12th and the 18th centuries; a Sculpture gallery displaying granite statues from the 9th century to the 17th century; and the Epigraphy gallery showcasing the genesis and evolution of ancient writings. Other galleries of interest in the museum here include, the one for Household Utensils made of bronze and copper, used by the rulers of Kochi; the Numismatics gallery, which systematically displays ancient coins, which were in circulation in the erstwhile province of Kochi and neighbouring regions; and the History gallery depicting some of the milestones of the Kochi dynasty; and a Megalithic gallery exhibiting remains of the great Stone Age.